Astroemeria don’t decay in a manner that is generally conducive to photography, I am finding! They are either alive and happy, or the petals just fall off, with seemingly no in-between….. However, I did kind of manage to get a few tell-tale dark edged petals, and some droopy stamens! You do like value for money, don’t you, Sue? 🙂 🙂 Just teasing! My carnations would probably be a sore disappointment too, but you can’t go wrong with roses. 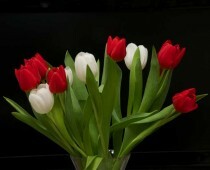 Roses are Ok, but tulips will always be the stars for me! Oh, and I’ve left them in a vase minus water, just to see what I will find in the morning…very likely a pile of petals (on top of those that have already fallen) that will take time to clear up…..what I do for art! The first two are lovely. Decaying or refusing to decay gracefully they are very beautiful, Sue! Oh…these images are beautiful and evoke the memory of their scent.